This tour "Paris Full Day" is a perfect way to discover all of Paris incl. a visit at the Louvre and Notre dame, a cruise down the Seine and lunch at The Eiffel Tower! Because all monuments visited on this day’s excursion are located along the Seine, we suggest using an unusual means of transport: The River Shuttle. The day starts off with a guided visit of the main rooms of the Louvre Museum , incl. the Venus de Milo ”, “the Winged Victory ”, and “Mona Lisa ” painted by Leonardo da Vinci . Then, the river shuttle takes you on the Seine and passes many of Paris' beautiful monuments en route to the Eiffel Tower where lunch (2 courses incl. drinks) is served in the unique setting of the new restaurant located on the 1st floor of the Tower. There is time to hand to visit the monument. Then, off with the river shuttle again to Notre-Dame Cathedral . A guided tour of this gothic work of art built between 1163 and 1345 is included in the tour! The Tour is in English! All entrance tickets and lunch are included in the price! Departure Times: The Tour starts at 9.30am. (From Apr. to Oct.: Mon. & Wed. to Sun.). (From Nov. to Mar. Mon., Fri. to Sun.) Closed every first Sunday of the month. Please be at the departure point at least 20 min. before start. The Louvre Tour begins at ParisCityVision and ends at Notre Dame! NB. 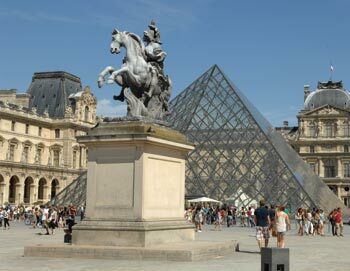 You walk from ParisCityVision through Tuileries gardens to The Louvre Museum! The Tour starts at 9.30am: From Apr. to Oct.: Mon., Wed., Thur., Fri., Sat. & Sun. From Nov. to Mar. Mon., Fri., Sat. & Sun.